I chose this necklace (exact here) because the tribal inspired design balanced the look and complemented the boldness of the shorts quite nicely. I really could have gone with either silver or gold jewelry with this, and since I couldn't quite decide, I grabbed this cameo ring (exact here) for good measure. It's a locket also, and anything with a dual purpose makes me swoon. Plus, there's just something about the cameo design that automatically makes me love it. It's adjustable also, which is an added bonus because rings are always too big for me! 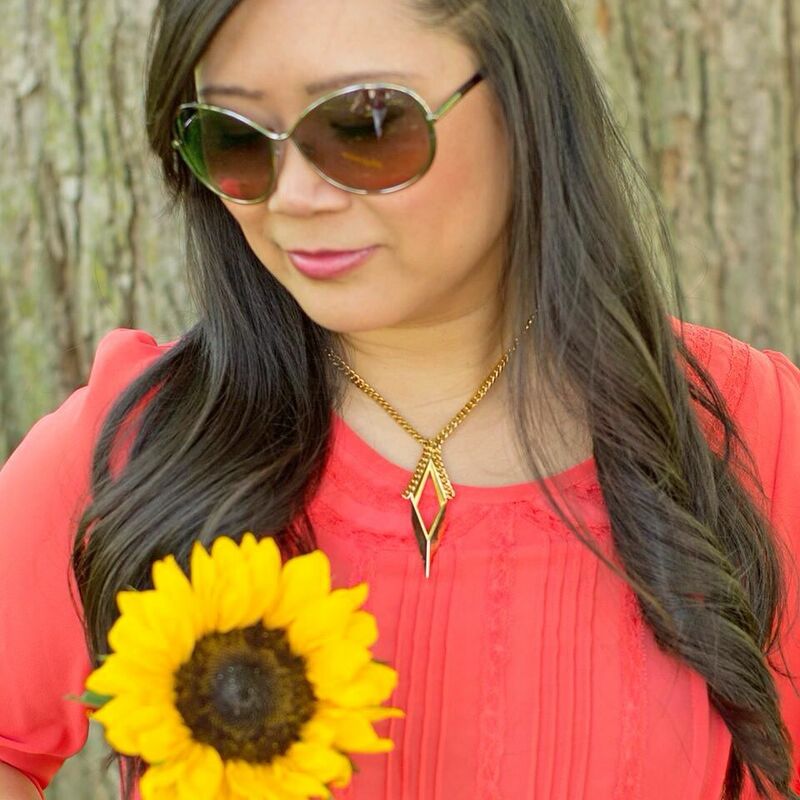 Sunnies: Tom Ford | Necklace: CS Gems (exact here) Use code CARYLEE15 for 15% off! | Bag: borrowed from Jenna | Top: Frenchi (option, option, short sleeved option here) | Bracelet: Nadri (option) | Ring: CS Gems (exact here) | Shorts: TCL Boutique | Sandals: American Eagle | Polish: Essie "Butler Please"
It's so fun to have lots of eyes on you as you're taking photos. I love the husband as my photographer, and am super grateful, but I know he's really just going through the motions and doesn't always catch if my hair is out of place or my muffin top is showing! 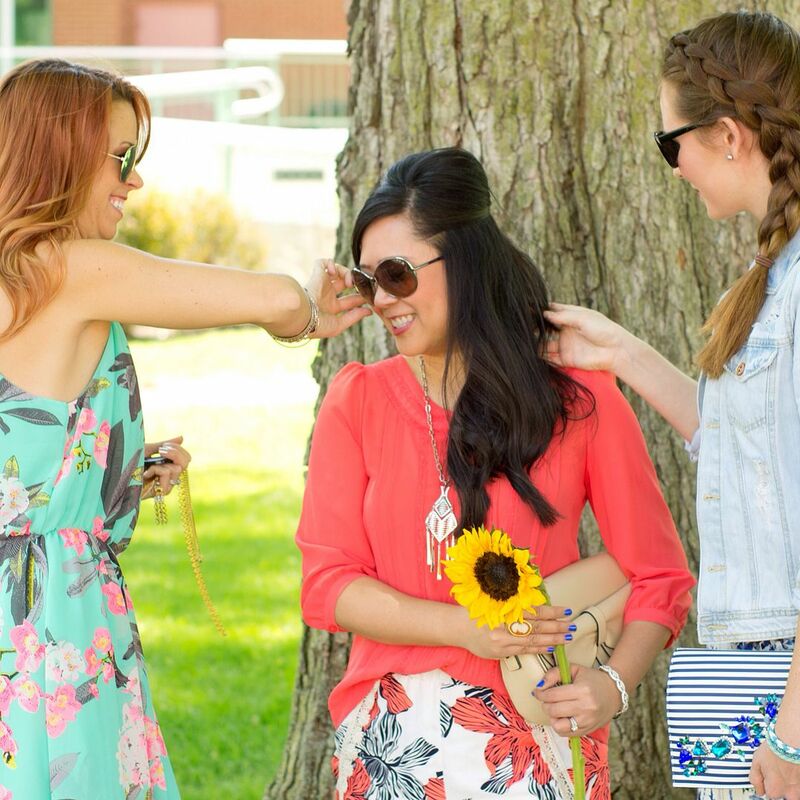 This picture is of Carrie (the "C" in CS Gems) and Jenna making some adjustments as I casually hold onto my sunflower for dear life. 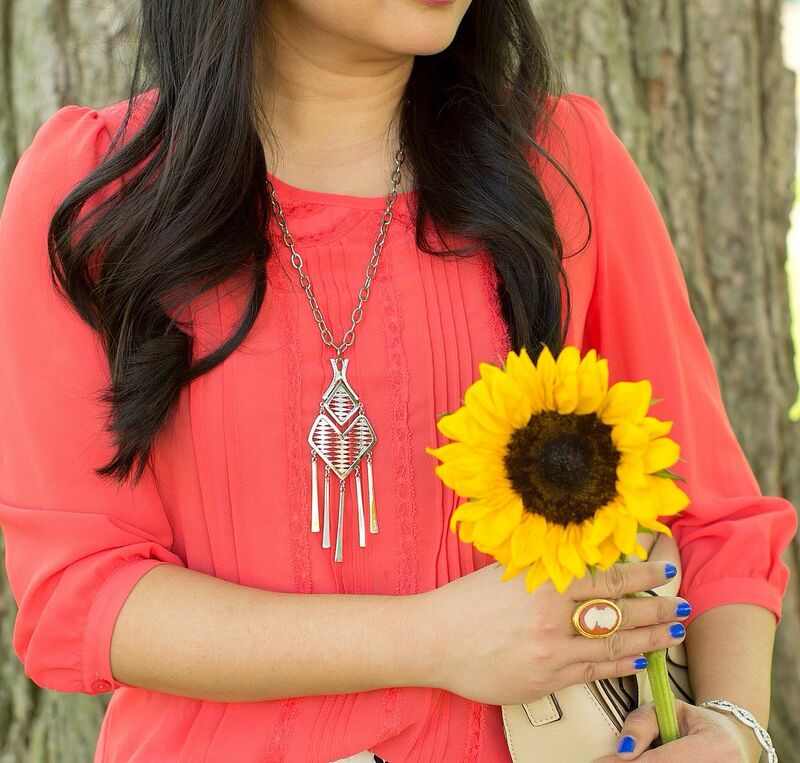 If you're more of a golden girl vs. silver, this short pendant necklace is gorgeous - exact here. And so affordable! 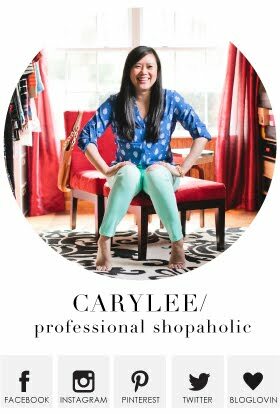 I think the gals at TCL Boutique were feeling like Carrie and Stacy are practically giving their pieces away based on how beautiful but low priced they are! It's truly hard for me not to buy every single piece! Be sure to stop by the CS Gems blog today as they're doing a little Q&A with yours truly! 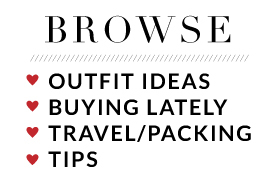 While you're there, why not do a bit of shopping? Use code CARYLEE15 for 15% off! NOTE: These posts were sponsored by TCL Boutique and CS Gems, but all opinions expressed are my own. This was my favorite outfit on you and love how bright all the pictures turned out! 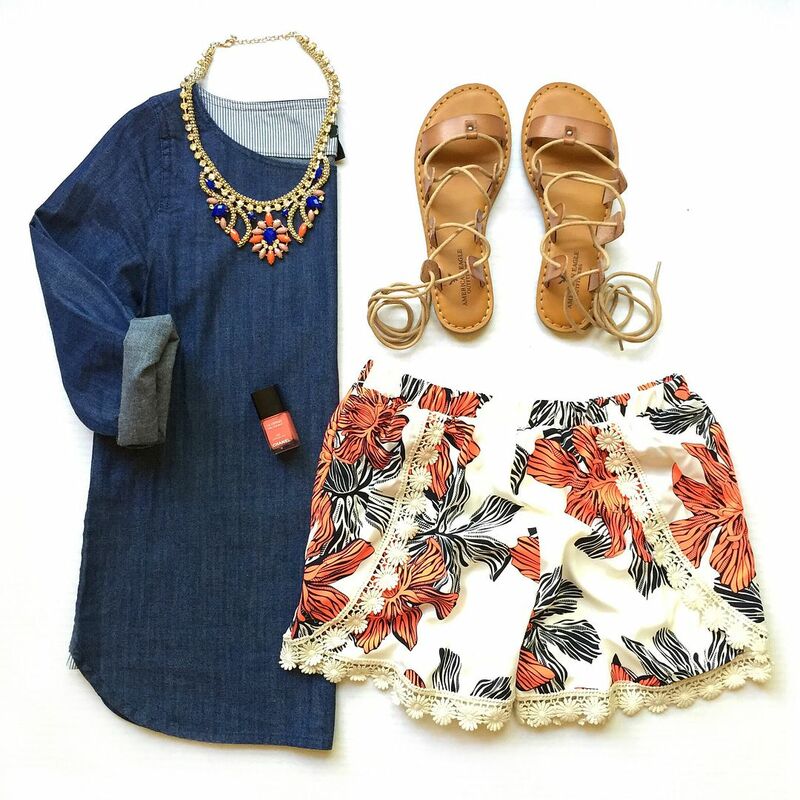 Perfect shorts for spring and summer! Can't wait to do another styling event!! 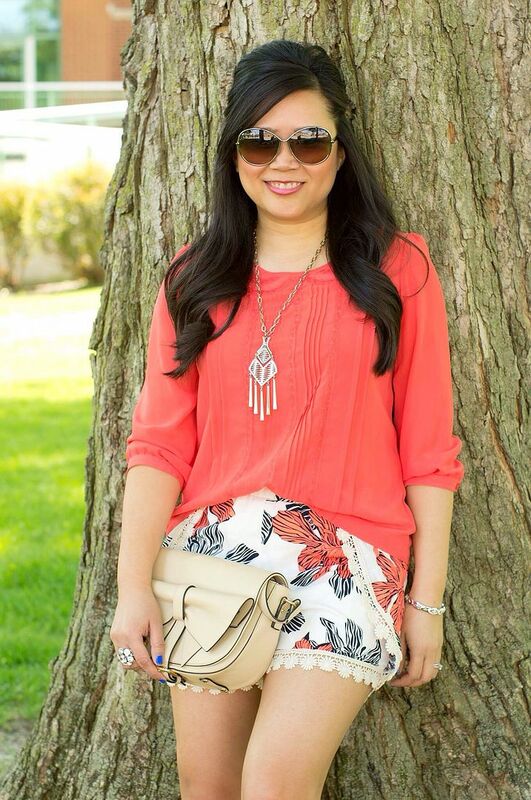 Those shorts are so adorable on you and the delicate jewelry is just beautiful! this outfit is the best, I love this look from head to toe and how cute is that necklace and these shorts! in LOVE with the shorts..the print, the cute and pretty lace details at the edges and your styling make this a perfect summer outfit!! Absolutely LOVE it! Those are so cute! Love the bright top paired with them! This is my ideal spring/summer outfit. Love it. Saw your feature on CS Gems... you look amazing! I love the colors in your outfit... and beautiful printed bottoms! Great look! I would wear every single piece in this look, I absolutely love it all!! You look so gorgeous!! Those shorts are SO cute! Love your you styled them. Very cute! This look is adorable. I loved your interview with CS Gems. It's so fun getting to know other bloggers!! Where is the chambray shirt from in your intsagram picture? I love how it does not have a collar! awww! Thank you so much! I am glad you enjoyed it! And it's from JCrew Factory, but unfortunately old. I wish it were still available because it's such a great piece! Thanks again! Thes shorts are adorable. I love the lace details! Carylee I'm seriously drooling on those shorts. This whole outfit is just PERFECT. My favorite and I just had to bring my tired and cranky body over to your side and say I'm still admiring you lol. 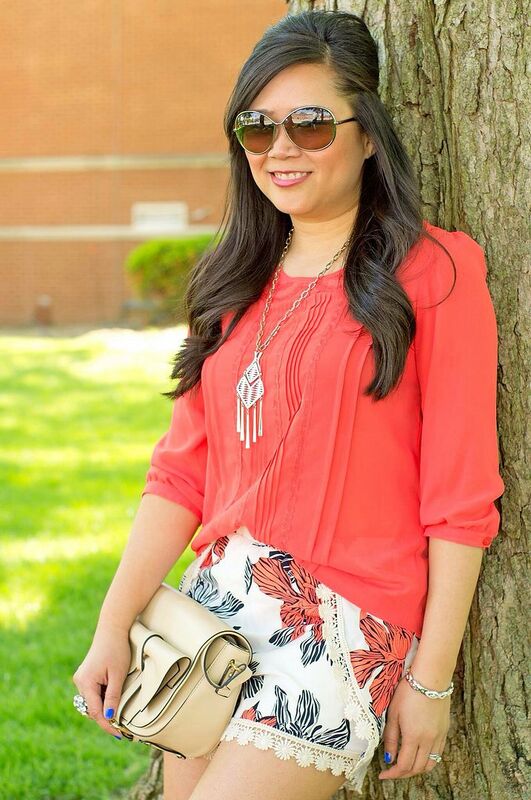 These shorts are the cutest and I love how you styled them, both ways! The best part of the soft shorts trend is how perfect they'll be for really hot and humid days. I love this outfit! Also, it's so nice to have someone fuss over you when getting picture's done! I splurge on a photography every other month and love what she captures!